When I look at relationships that I aspire to resemble in my own marriage, I look no further than our President and First Lady. 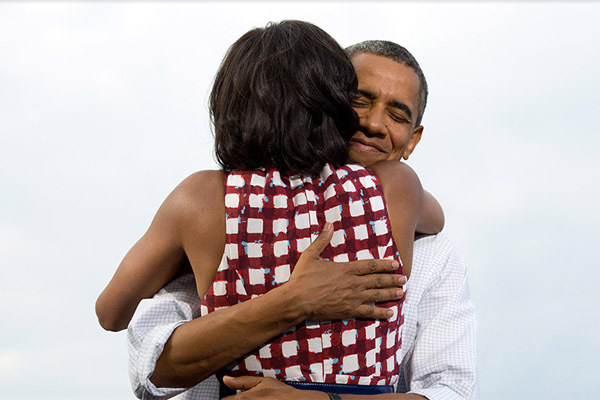 To me, the Obamas are the epitome of a healthy, loving, marriage. The first and last rule of any successful marriage is mutual respect, and there is no greater example of this than the Obamas. 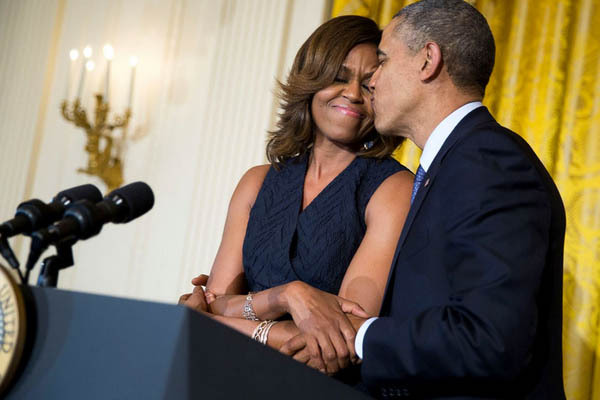 During their eight years in office and over a decade in the public eye, the Obamas have been scandal free, always presented a united front publicly and have not once been recorded disparaging, disrespecting, or demonstrating anything other than the utmost respect for one another. Now let’s be real, there is no doubt that even the Obamas have their share of disagreements and conflicts, like any marriage, but because they hold each other in such high esteem and respect, these relationship hiccups have never derailed them. Remember how he respectfully calmed the crowd when this Trump protestor interrupted his speech? Well, if he can extend this respect to his opponents, I’m sure the same—if not greater—respect is given to his wife. In a great relationship, couples talk freely, openly and feel safe sharing their innermost and private thoughts. Both partners use tact when speaking, avoiding attacking, controlling or intentionally hurtful comments. Attentive listening and trying to understand what their partner is saying with sympathy is critical; rather than not really listening and just waiting to respond, dismissing what they hear or arguing down and debating what they are saying when the perspective is different. Communication is the backbone of any relationship, especially when it comes to a healthy long-term marriage. Now, truth be told, I don’t know how the Obamas communicate with each other in private, but if I can assume anything from the President’s debate style and interviews, he follows the aforementioned rules of effective communication. So I can only imagine that he is even more of a respectful and loving communicator with his wife. For nearly a decade, the Obamas have been in the public eye. We have witnessed them through photos and videos share affection with one another and not shy away from a little PDA. The Obamas are always holding hands. 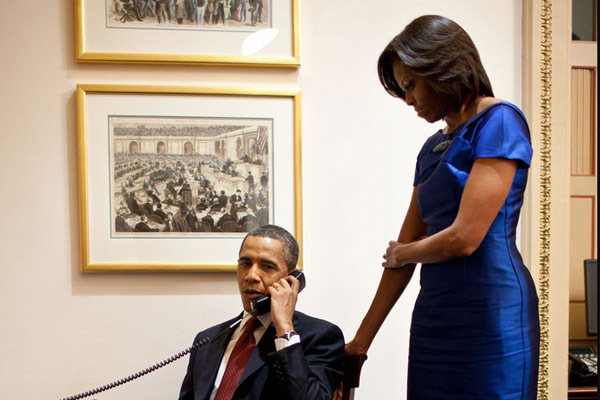 We’ve seen Michelle straightening Barack’s tie. We saw Barack putting his coat around Michelle’s shoulders at the inauguration ball. They are always hugging and giving each other kisses before and after big events/speeches/rallies. We’ve seen Barack touching the small of Michelle’s back as they deplane from Air Force One or as they exit a building. It is this constant non-verbal communication of love and caring through touch and physical contact that helps keep their connection strong. And I’m even more encouraged to show love and affection in my marriage because of them. There is no tougher, no more challenging, no more high stakes job in this country than that of President of the United States. Every president in recorded history has said fulfilling the role of president is a team effort in the truest sense. When a couple acts as a team no matter what obstacles or hardships they face, they will always prevail. The fact that the Obamas have completed eight years in office and have worked together on elections, re-elections, health initiatives such as Let’s Move! and Obamacare, raising two children is proof of their partnership. And in my opinion, they are probably the greatest example of marital teamwork that every couple should aspire to. Both the President and the First Lady face extreme scrutiny, domestically and internationally, as much if not more than any other presidential couple in history (in my opinion, at least). This can be demoralizing and seemingly insurmountable without a strong partner in your corner. Knowing you have someone who has your back and supports you no matter what is essential to individual success and self-worth. We’ve seen them on the campaign trail and in interviews; the Obamas are each other’s best defenders, and they shield one another from negative outside influences. Remember, Michelle Obama’s DNC speech about how she handled her husband’s haters? Love is the ability and willingness to allow your partner to be free to choose for themselves how they want to be and what they want to do. Love is not having to conform to the expectations you may have of them or modifying themselves to please you. If you cannot accept your partner’s flaws and all, then you need to re-think your decision to be together. Now, I’m not sure if the Obamas have had these conversations. But as political figures, they are likely pressured by outsiders, pundits, strategists and opponents to change this or change this about themselves. So, I imagine within their marriage is the only real place they can be vulnerable and be themselves. I imagine within their marriage, they can love each for who they really are. Michelle has said their relationship started out as friends and developed from there. In long-term relationships, it is often a challenge to remain friends and for the friendship to continue growing and expanding. It appears the Obamas have done this beautifully by not losing sight of one another while things happen around them, not allowing their jobs, titles, positions and naysayers to disrupt their friendship and their focus on one another. If they can do this while heading a nation, my husband and I can certainly carve out time for our friendship to prosper. This is especially important in long-term relationships. 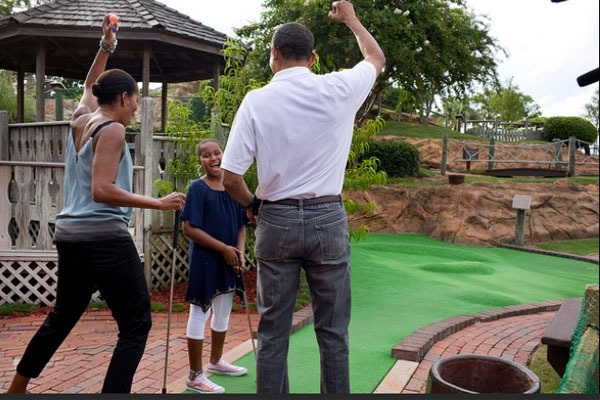 Like the Obamas reportedly do, set date nights or weekend getaways once a month or as frequently as possible. Continue doing the sweet loving things you did for one another in the beginning of your relationship without even thinking. This makes your partner feel valued and special and more likely to reciprocate in kind. 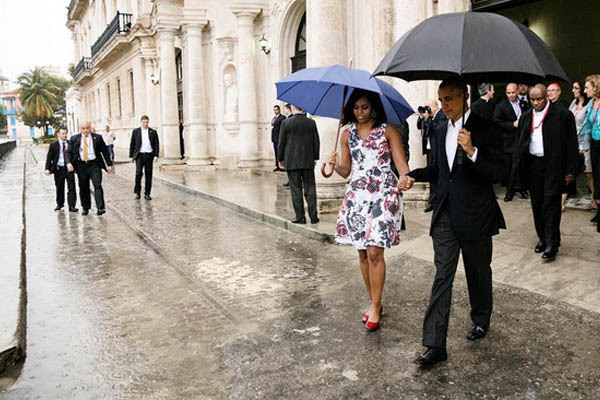 Being the most high-powered couple in the land never seemed to be a source of tension or conflict for the Obamas. 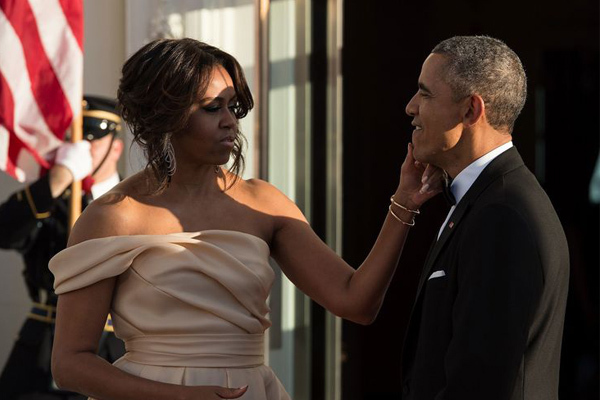 At nearly every opportunity, both Barack and Michelle take the time to praise one another, compliment each other and they show up for each other when one or the other has received public recognition for their accomplishments. The lesson here is, praising your spouse or letting them “get some shine” doesn’t diminish you or your accomplishments in any way. In fact, like the Obamas, we should be our spouses’ No.1 and most enthusiastic cheerleaders. President Obama has often talked about the state of America’s children in terms of social issues, i.e. absent parents, poverty/socio-economic conditions, education, etc. But by modeling what a healthy loving relationship looks like, he and Michelle have given an amazing gift to their daughters and to America’s children. Therefore it is no surprise that Malia and Sasha are flourishing, brimming with life, happiness and promise. When you have parents who aren’t afraid to demonstrate their love for another, that always show respect for one another, who give trust and loyalty to one another, the result are thriving productive children. I, too, want my marriage to serve as an example of a healthy relationship to my children, family, friends and another other person in my circle who needs a positive relationship model.